So what we have here is: The awkward quiet girl with big ears and greasy hair from high school, The bathing Beauty (thanks Lesley) and Dr. Manhattan. Dont ask me where these ideas come from. Soon to come is Bart Simpson and Rorschach. AND, whats cooler is that my friend and WONDERFUL photographer Halston Bruce is coming over to photograph all my stuff so I can have a little book of all my monkeys and stuff I sell! YAY! So look in the next week for a bunch of updated good pictures replacing my camera phone pictures on here! Im so stoked! Funky monkey! 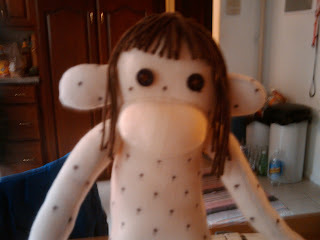 Dude, why you be makin sock monkeys of me in high school??? I can't wait to see the fancy pictures! Aww that is awesome the book is a great idea!! 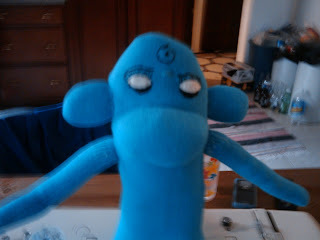 Dr. manhattan is creepy, like he would move around at night and raid your refrigerator. "Don't ask me where these ideas come from"? How about I just take credit for the Watchmen sock monkeys idea, huh, tamara? huh?